Mark Bittman is a culinary hero of mine, and his recipe for cooking pasta in the style of risotto is nothing short of brilliant. He has a keen ability to take simple ingredients and pull them together in new ways that inspire me. You can find Mark’s recipes in his books about cooking and healthy diet, or in The New York Times almost every week. You can use any cut, dried pasta – penne, fusilli, farfalle – even spaghetti broken into pieces. No need to make a special trip to buy the traditional arborio rice used in most risotto recipes. I used gemelii because that’s what I had in the pantry. 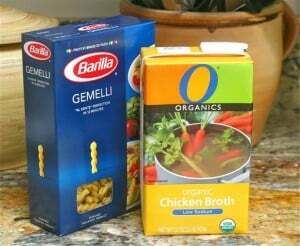 After all, who doesn’t have pasta and stock on hand? Omit the chicken and use vegetable stock and you have a vegetarian entrée. Any sliced mushrooms will do and I sometimes just throw in left-over cooked chicken. I found his cooking times a bit short and adjusted them in my version. He suggests these proportions serve four and I think that was a typo. Two generous portions result from this amount of pasta. How to make risotto using pasta instead of arborio rice, a technique I learned from Mark Bittman's recipe. Heat the oil in a large, deep skillet over medium heat until hot. Add the shallot, garlic and mushrooms. Cook for 5 minutes until mushrooms are browned. Add 2 more tablespoons of oil, add the pasta and cook, stirring occasionally, until it is glossy and coated with oil, about 2 minutes. Season with salt and/or pepper and add the wine. Cook until the wine has been absorbed. Add the stock in ½ cup portions, stirring after each addition. Keep the heat at medium throughout the process. Once the stock has been mostly absorbed, add another ½ cup. After the pasta has cooked a total of 20 minutes and all the stock added, taste it. It should be tender with a bit of firmness. Add the chicken and cook until it is white in the center. Risotto should be neither soupy nor dry. Garnish with chopped parsley and Parmesan. Serve. Mark Bittman’s recipes are always fabulous and this looks so good! 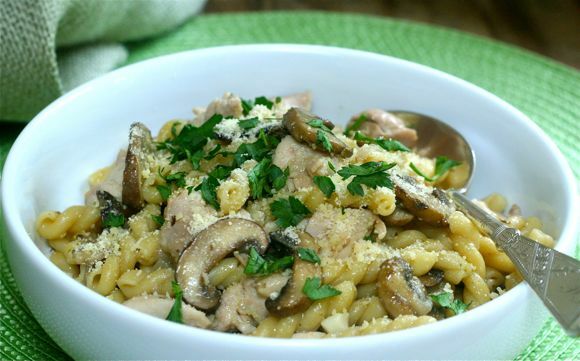 I love the mushrooms and the risotto combo…I haven’t made either in far too long! Thank you Averie – I will be reheating this later for our supper. Wow, is that pretty! And now you have me wanting it for dinner. I am all over this one. We are having it for supper – an old favorite I rediscovered and wanted to share. Can’t wait to hear all your pasta ideas after your trip – hope all is going well.. This is ingenious. Great idea. Thanks, Lynda – not my idea but one I happily “borrowed” and gave credit for. What a fun dish – must try this on a night when I’m not driving around like chauffeur until 7:30 pm! Nice photos and a wonderful technique to share. Thanks Liz and Mark! Wow, another gorgeous recipe to bookmark Liz. Great photos and I look forward to making this myself, really nice technique. Let me know how it works for you, Wendy? Brilliant indeed. I’ve never cooked pasta this way, but on your suggestion, certainly will soon. Love the new look of your site too, Liz. Steve, I had forgotten about this recipe and technique – hope you try it. Thanks re my blog’s new look, a work in progress – need photos of me next .. Welcome to my site, inspired by the women in my family who fed and nurtured me in their kitchens. My husband Larry and I live in San Diego, where I cook healthy meals for our friends and family. © 2019 Liz The Chef. All Rights Reserved.